SIP Trunking – connecting business PBXs to operator’s SIP based telephony infrastructure via IP instead of TDM lines – has opened up new market segments and new business opportunities for telecom operators. The shift to IP-PBXs at the customer site and to IP based infrastructure at the carrier side, is making SIP Trunking an obvious development. Today, almost every ISP, broadband provider or telco in general are planning to offer or are already offering SIP Trunking services. However, getting business customers’ telephony traffic, isn’t just about having a good service and roll it out over a good IP pipe (dedicated/managed or over the Internet) – one also has to be able to connect the service to the customer’s PBX in the customer’s environment. Having a SIP Trunking interface on an IP-PBX is not sufficient! Most obvious is the firewall/NAT traversal problem. Modern IP Phones and IP- PBXs reside on the business LAN which is protected by a firewall. But SIP communication does not pass ordinary firewalls or even NATs. A NAT/firewall traversal method is required, which is one of the functions the IX78 E-SBC provide. In addition, there are many variants in the SIP capabilities and implementations in PBXs as well as the trunking service and delivery, something that the IX78 E-SBC can normalize. 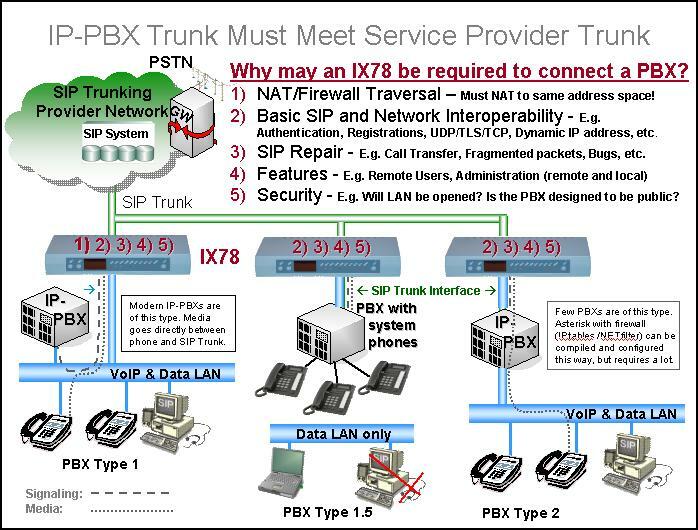 The picture below shows the functions and benefits the IX78 E-SCB brings when SIP Trunking various types of PBXs. Intertex’s sister company Ingate is well known in the SIP Trunking market. While the Ingate products address larger installations, Intertex products are focused on the SOHO and SBE higher volume market segment. Both companies cooperate closely and share the SIP development and interoperability testing against the various PBXs, and can therefore offer the most comprehensive interoperability listing. 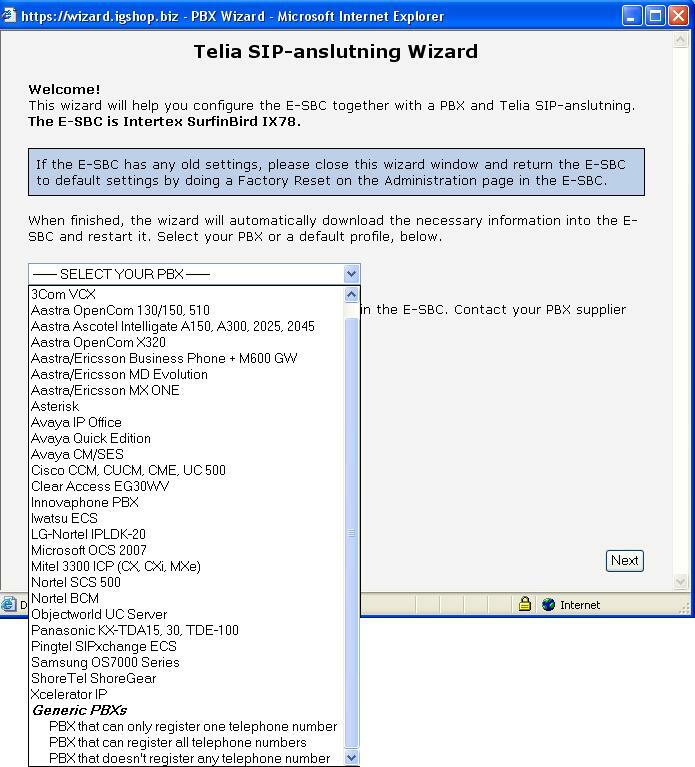 Below is a screenshot from the installation wizard we have created for Swedish incumbent telco Telia, for their “Telia SIP-anslutning” service (8 simultaneous calls). Every installation is done with an IX78 E-SBC and the service is either delivered over ADSL 2+ AnnexM with a quality assured PVC for the voice, or on their managed business Internet service. The IX78 E-SBC handles both the voice and data traffic (with QoS), or optionally, only the Voice traffic. The Intertex IX78 E-SBC offers solutions for all types of SIP trunking services and IP-PBXs (and conventional PBXs with an added IP/SIP interface). It has a capacity for 50 simultaneous calls over the trunk. Without an Intertex type of CPE, a SIP Trunking service will only reach a limited portion of the market; only a few types of PBXs can be connected, or a connection may require that the customer have to (re)install his local IP-PBX telephony in a way that inhibits unified communication and other expected functions and features of his telephony system. With the Intertex IX78 E-SBC deployed as part of the SIP Trunking service, your service will be able to connect all types of PBXs with SIP Trunking interface. With the IX78 E-SBC, the customer IP-PBX simply remains connected to the LAN and the customer can use both phones and PC clients as well as WLAN connected mobile phones as part of their telephony solution. Remote users (e.g. home workers and road worries) using SIP clients, can also connect to the PBX over the Internet.